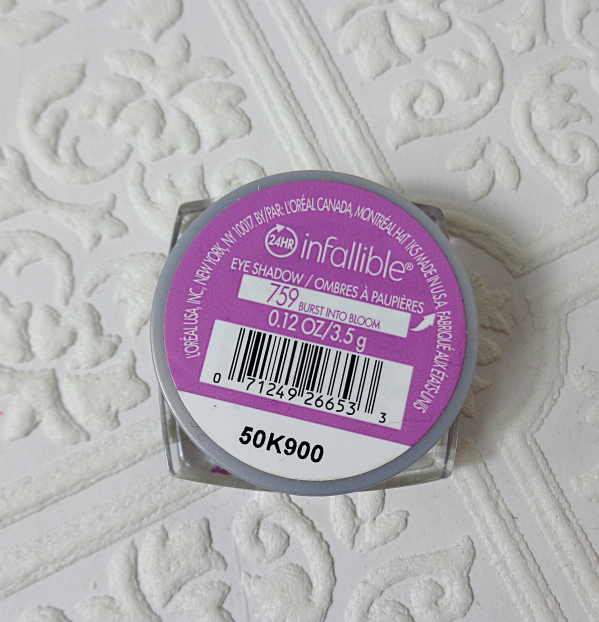 L'Oreal Infallible is the range that I reach for most frequently in daily eye makeup routines. The creamy yet slightly drier (than most squishy soft hybrid eyeshadows) texture is very easy to use and it stays on for a long time if not for 24 hours. When L'Oreal brought out the new Butterfly Collection for Spring 2014, I was obviously intrigued but maybe not enough to make an immediate purchase. A couple months later, Burst Into Bloom still managed to sneak into my shopping cart, whispering to me "Pick me, I'm "the spring color" for you!". Burst Into Bloom is a bright orchid shade. Turns out she lied to me. Burst Into Bloom is an example of "Radiant Orchid", the color of the year 2014 (by Pantone), but not-so-wearable version of it, unfortunately. It is too shimmery even for me (and I usually don't have any problem with shimmery eyeshadows) and there is inevitable fallouts because of the glitters. The texture and the wear is quite consistent with other Infallibles I own, though. 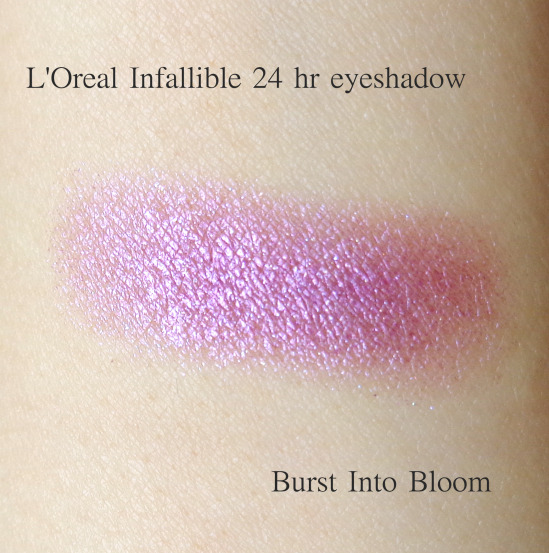 Burst Into Bloom is virtually a pink shade on me, and I am not so happy about it. I am still experimenting with this color trying to make it work for me. I will have to tone it down by layering it over a black base or pack a motherload of it on my lids and keep other parts to bare minimum (or something cause this is still a very pretty color to look at!). Have you tried the new colors from Infallible Butterfly Collection? Any tips to wear a "Radiant Orchid" shade nicely? I agree. But this color would look beautiful against green, blue even grey eyes. So pretty! But these are too sparkly for even me. I've been testing out the Sephora Radiant Orchid stuff, and I find that if you want to wear it on your lids, matte is best. 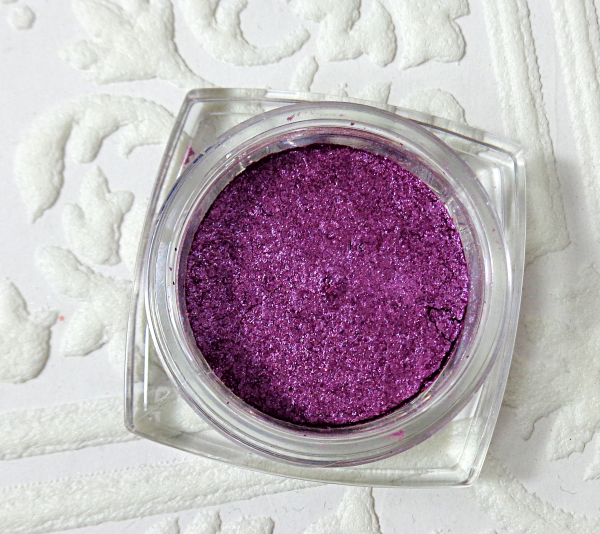 I agree matte orchid shade is the best for eyeshadow! Hey Lena, hmm maybe adding a matte shade in the crease or outer half would tone the shimmer factor down? Otherwise, how about using a satin/matte all-over shade and patting this in the center of the lid? I like how brightening this trick is. That looks so nice on you. You are right, it would be really nice combined with darker color for smokey eye. I tend to avoid bright colors except blue, because I just don't know how to wear them. On the infallible eyeshadows, I literally came home from grocery store with amber rush from the infallible eyeshadows. I didn't like it too much when I used it alone, but maybe I will have better luck playing with it. Burst into Bloom is a beautiful color very shimmering but is a lovely color. maybe you can try to have a black base to tone it down a little bit? It is funny cause I used to sport shimmery pink shades on my lids all the time when I was young. The swatch is so pretty though! I think you can work it as an accent shade or layer it with something more intense underneath it to tease out the purple perhaps. I couldn't agree more with you that the color itself is so pretty! Sometimes perfect colors like this is the hardest to wear, though. I think it's absolutely beautiful. More than 25 shades of those eyeshadows have been released but here in singapore we've only got 10!!! I'm so sad! Try wearing a brown base and then this on top, it won't be as pink and will probably look more purple! Radiant Orchid seems to be everywhere! I actually like it on you, I think it's something unique and colourful and very springtime-appropriate :) Maybe the colour will grow on you. I seem to have similar issues with all the Infallible eyeshadows I own though - can't find a shade that I'm really in love with and excited about colour-wise, even of the neutral ones I have. I actually like all the colors I own from the range, so I really didn't see it coming. Haha. You're right! If it was a lipstick shade, I would be sporting it without hesitating too much! That's too bad about the fall out because it really is a pretty color. Have you tried something like Pixie Epoxy under the shadow to keep it a bit more fixed? This shade is beautiful, Lena :-) I haven't seen these e/s around for a while now. I was wondering if they're discontinued or something. Thank you, Lily! I still I should have bought the matte orchid shade from Clinique! I totally agree with you. This is a wonderful color for green eyed beauties like you! These items look so beautiful and bright! oooh it's so bright and pretty! I always have trouble making those kinds of hues work for me-- and i'd love to see the looks you create with it! As much as I feel disappointed about the color, I feel challenged too! LoL. I actually quite like this on you, though it is surprisingly pink on your lids as oppose to how it looks in the pan. I still haven't got into Radiant Orchard just yet, but I'm sure I'll buy into it eventually - it's everywhere! I don't think i could pull this off unless i have black liner and smudge it out with some greys? 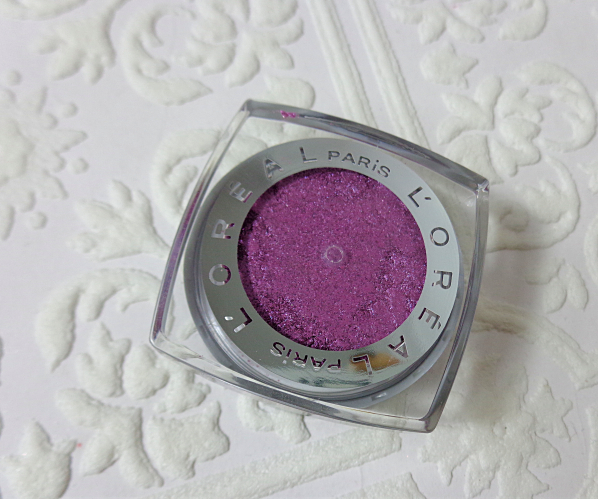 I personally prefer the loreal colour appeal mono shadows, great shimmer and colour pay off. It actually looks beautiful against your skintone, Lena. i haven't tried any Radiant Orchid shades yet, though. It is tricky, but fun color to wear for sure. This colour totally agrees with your complexion! I have yet to spot this shade at my local drugstore, but whew - so excited to see bright colours starting to pop up! I was mainly sporting dark neutrals all seasons..but I did enjoy colors like this before. Maybe it's time to revisit them! This range is a very high quality in my opinion. Creamy and easy to blend. This shade is very "radiant orchid" indeed. It's a shame it's a touch too shimmery but it complements your eyes very well. I actually love the more fuchsia colour it pulls on your lids! ...Maybe I just think you're pretteh. Because I totally agree with you on the textural problems of these Infallibles (I have similar issues with their Armani ETKI sisters too) and the trickiness of these radiant orchid shades. And yet. YOU SO PRETTY. I love the addition of the bluer purple to offset it. Maybe layering something similar under/over the Infallible would be nice? Thanks for much, this color doesn't look so bad after your compliments. LOL. This is my first Infallible with glitters. Maybe I was naive to think there wouldn't be any fallout. This looks pretty on you! I don't think I'd be able to pull of this color, but I like how it looks! I really appreciate your comment since that is the balance I try to achieve in this blog as well as in my real life. I kinda wish I had bought the dark bluish purple instead of this. I am glad to getting lots of ideas for wearing this color from you guys, though!